We have been manufacturing, exporting different type of machinery spare parts for different industry like, web guiding system, air shaft , rubber roller and Batch Printing Machine, Batch Coding Machine many more. it has become increasingly important for us to deliver a wide range of Manual Batch Coding Machine. Offered Hand Operated Batch Printing Machine is designed as per set industry standard with the utilization of the excellent grade components and ultra modern technology. This Hand Operated Batch Printing and Coding Machines is in form of designer crystal at room temperature. 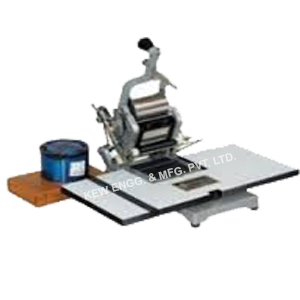 Our Hand Operated Batch Printing and Coding Machines are widely known for their productivity. Batch coder Machine is a high utility product which functions in many applications such as to code mandatory/obligatory variable information like Best Before, Batch No., Mfg. Date, Exp. Date, M.R.P. Incl. Of All Taxes or any other details simultaneously in one stroke. HOP-60-Printing Area :- 50mm. x 65mm. HOP-90-Printing Area :- 75mm. x 90mm. 10 to 15 labels/cartons/pouches/min. manually.